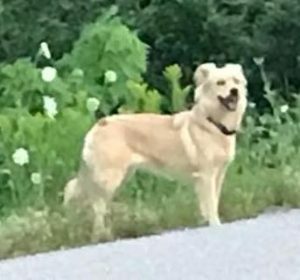 Additional Notes: Does anyone in the far end of Coxheath recognize this pup? It’s been pacing Coxheath road between 2100’s and Levatte’s old pit for a few hours now. She(?) is petite, collared and looks otherwise healthy but obviously tired. She will not come close but food and water has been left in the pit entrance for her so hopefully she stays off the road for the night.